Contents and Media: Two identical decal sheet each measuring 135mm X 95mm, 3 X A5 sized instruction pages in a zip-lock bag. 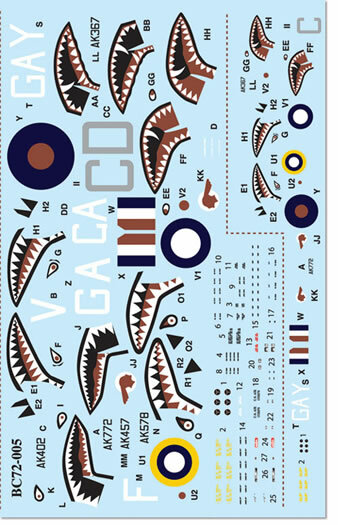 With the quality you would expect being printed by Catograph in Italy, you also get an extra set of stencils plus bonus 1/144th scale markings. 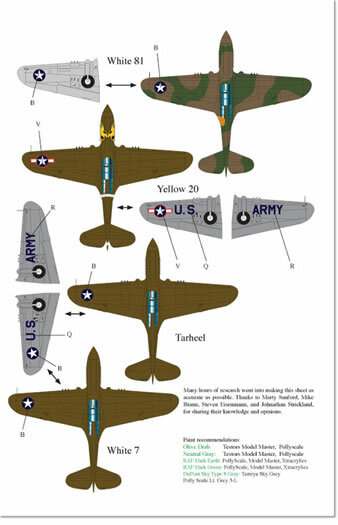 No stencil guide for the P-40C/Tomahawk Mk. IIB in sheet 72005. It would take a much more experienced reviewer than me to criticize the accuracy of Roy Sutherland's decals. I believe he takes every effort to make them as accurate as possible and that is good enough for me. Barracudacals is the decal side of Roy Sutherland's Barracuda Studios that is also producing resin sets and books of very high quality. Roy is a master modeller himself and has a wealth of experience in these products and a good idea of what the modeller wants. 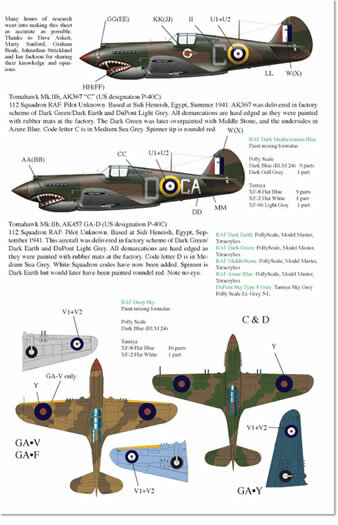 As mentioned above in the summery, there are two identical decal sheets which are supplied to give you enough national markings and serials to build a model. 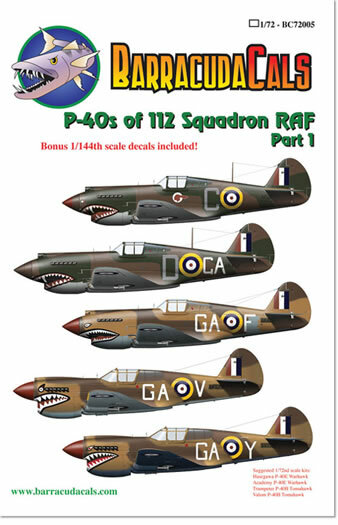 As a bonus, you also get an extra set of stencils plus two similar sets in 1/144th scale. The aircraft on this sheet are three Tomahawk Mk. IIBs and two Kittyhawk Mk. Is as follows. Mk. I, AK578 GA-V. Also flown by Neville Duke and in the same colours, based at Gambut, Libya, February 1942. Mk. I, AK772 GA-Y flown by P.O. Burney & Sqn Ldr. Clive Caldwell at Gambut, Libya Spring 1942. The same colour scheme as the two above except this one has Dark Mediterranean Blue or Deep Sky underside and all three with red spinners. A Tomahawk Mk. IIB, AK367 “C”, pilot unknown, Sidi Heneish, Egypt 1941, in Dark Green/ Dark Earth over Light Grey delivery scheme, a red spinner tip and there is no Squadron code. Finally, another Tomahawk Mk. IIB, AK457 GA-D, pilot unknown, at the same location, late 1941. In the same colours as the aircraft above, the aircraft letter is in Medium Sea Grey while the Squadron Code is in White. All aircraft have Shark Mouths of various shapes and sizes except GA-D which has no eye. 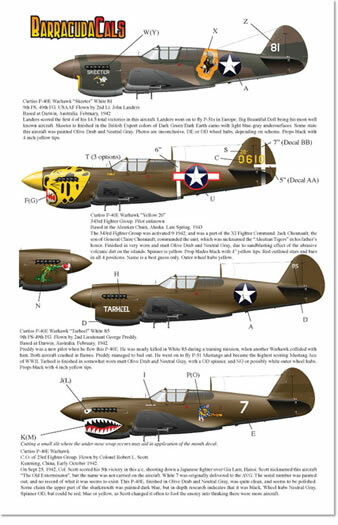 Unlike BC72005 which covers five aircraft, this one has only four and all are of the same type, P-40E. Named “Skeeter”, White 81 of the 9th FS, 49th FG, USAAF flown by 2nd Lt. John Landers, Darwin, Australia, 1941. This aircraft is possibly in the British Export colours of Dark Green/Dark earth over Light Grey with the name and a white feathered bird below the exhaust on the left hand side plus an orange patch with a diving eagle just in front of the fuselage star also on the left. Yellow 20 of the 343rd Fighter Group, pilot unknown, in the Aleutians 1943. This one's in Olive Drab/Neutral Grey with a yellow spinner and tiger's head and red bordered national markings in all four positions. 2nd Lt. George Preddy's “Tarheel”, White 85, Darwin, Australia, 1942 in OD/NG with the name below the left hand exhaust and a green dragons head under the right. Preddy was almost killed in this machine when he collided with another aircraft on a training flight but managed to bail out. Flown by the CO. of the 23rd Fighter Group, Colonel Robert L. Scott, Kunming, China 1942, this last aircraft is in OD/NG with the Flying Tigers shark mouth on the nose, their emblem under and behind the cockpit, white 7 on the fuselage sides and US markings in the two wing positions only. I had to try really hard to find a fault with these sets but there is one very small one. 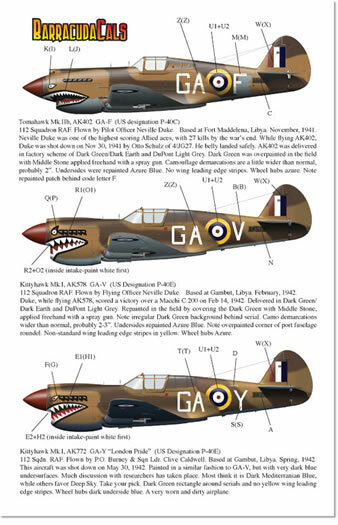 BC72005, P-40s of 112 Squadron RAF Part 1 has a stencil guide for the P-40E/Kittyhawk Mk. 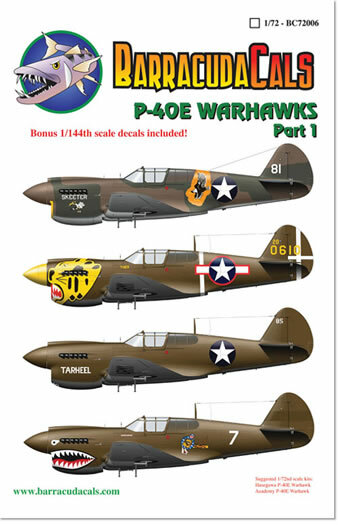 I but nothing for the P-40C/Tomahawk Mk. IIB. If they are the same then I apologize but if I'm correct then all I can say is “Come on Roy, wake up, what do you think you are doing”. Sorry, occasionally I'm inclined to over step the mark and I have to slap myself down, kerthump! So, there you have it. 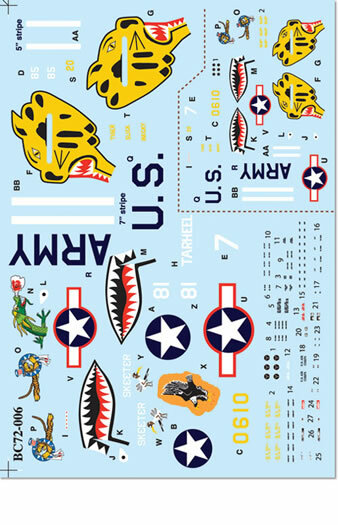 Two more decal sheets from one of the best manufacturers in the hobby and a US one who is not afraid to put product out there in Braille Scale.